Time for a new update, finally! This update focuses on many gameplay changes to fix balancing issues and exploits. Elephants and Mammoths have been a consistent source of exploiting, used by some players to become pretty much unbeatable and making this unit too central to military gameplay. 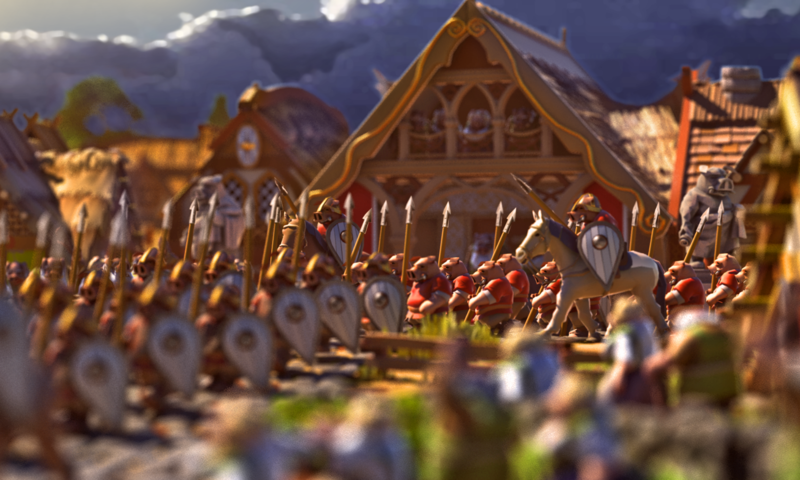 – To counter players storing all their livestock -including hundreds of hoarded elephants and mammoths- in their army’s inventories (to avoiding having to maintain labor intensive paddocks), animals may now escape and be lost from the inventory via an event, especially if kept in large numbers relative to the units guarding them. The only way to keep them safely being with proper paddock buildings. 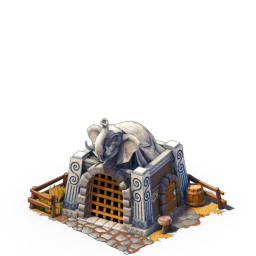 – To counter players keeping hundreds of elephants as resource and only insta-recruiting them for war (avoiding the high upkeep of these units), elephants can now only be stored in a special Elephant pen building (they cannot go into regular cheap paddocks anymore) that costs high maintenance and can only store 1 elephant. These 2 measure should help avoid that a few players monopolize hundreds of elephants, and to counter exploits allowing to escape the high cost of maintaining a few elephant units, as it should remain an elite and expensive unit. The new “Elephant pen” building. To counter players deploying troops or placing buildings such as defensive towers in inaccessible areas on purpose ( building a staircase to access a hilltop/wall > building there > deleting the staircase afterwards ), any building in an inacessible area will now be auto-abandonned. Troops deployed into inacessible areas will also auto-redeploy to default positions. To counter players using a second account (or their own) to repeatedly spawn as colonies of a target enemey in order to sabotage them from inside, or to spawn in a nearby inactive player as its successor before using all its resources to suicide against that enemy, the spawning rules have been modified. – The basic cooloff period is now exponential and increases at every new character made in that same game. – Colonies and successions are now “Precious starts” with their own cooloff period of 15x the default one ( that’s 15 days in persistent ) regardless of the player’s main cooloff and affecting all the Precious start types as soon as one is used. Therefore a player starting as a colony will not be able to restart in another one for 15 days even if its his first character with a 1 day cooloff. – To prevent players using the “spawn close to” feature to spawn near their enemies in order to sabotage them by suicide and griefing, all characters now have a unique “invite code” which must be communicated to the new player willing to spawn close, ensuring that this feature can only be used between consenting players. Many exploits involving the milking of inactive/dead characters to provide high amounts of extra State power to Nations in order to allow them to grow bigger have been countered. That includes auto-removal of dead characters from nations, limitation of the transferable State power via treaties, and freezing of state power and tax transfers from inactive characters. Representative money proved itself too problematic for the game balance as it trivialized all the other mechanics and difficulties of the economy by being too powerful and easy, making some players infinitely rich. Until it can be better modeled by the addition of some gameplay mechanics, its effects have been mostly disabled. As a placeholder solution and to keep Gold and Silver relevant in the meantime, these 2 metals are now a attributable resource that fills the need for Luxury of the population. – fixed 3rd party operators in your trade network not being available in the trade route menu. – added various extra warnings and ‘first time’ tutorial messages. – added ‘Invite codes’, which are codes specific to every character and now required when trying to spawn near a specific one. This ensures a player may now only use the ‘spawn close to’ feature with the other player’s agreement, as he must have his invite code. – added a ‘precious start’ attribute to colony and succession start types. they have a x15 cooloff (so 15 days in persistent) once used, regardless of the player’s spawn cooloff. – elephants/mammoths now have their own ‘paddock’ building that can only store 1 elephant and costs high upkeep. They can’t be kept in regular paddocks anymore. – animals kept in formation’s inventories can now escape, especially if kept in large numbers relative to their keepers. – decreased score cost of victory points. – subordinates now contribute to the score. players receive a fraction of their subordinate’s scores. – max transfered state power by treaties is now 25%. – active characters with no territories are now ‘powerless’. – inactive characters with no cities are now auto-abandonned from their owning player, and therefore becoming directly “dead”. – dead/powerless characters have 0 production of state power. – dead/powerless do not transfer taxes or state power in nations. – small fences now cost only 0.5 of wood or stone. – fixed purchased resources on markets not being state owned. – WARNING: fixed calculation errors of income from state-owned resources. the error generated extremely high income in some cases, allowing for exploit.